The THULE VeloCompact 3 are designed for easy mounting and adjustment for bikes through detachable bike arms with lockable knobs. The VeloCompact carries bikes with large wheelbases, provides easy access to the book with the foot pedal tilt feature and an adjustable one-handed coupling for easy mounting of bike rack. The easy to use features such as the easy pump buckles and simple fold flat and store makes mounting and dismantling quick and simple. Discounted prices on cycle carries when a towbar is purchased and installed from CBS Automotive. 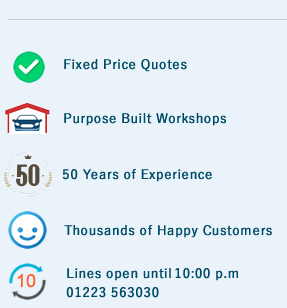 For more information phone us on 01223 563030 or come and visit our bespoke workshop and showroom for a free quote.